Those who have seen the 'Harry Potter movies' have watched the amazing power of the phoenix. Its tear once cured Harry of Basilisk poison and another time, it went up in a puff of flame only to come back to life again. It would truly be an amazing bird, if only it were real. The Phoenix symbolizes rebirth, especially of the sun, and has variants in European, Central American, Egyptian and Asian cultures. In the 19th century, Hans Christian Anderson wrote a story about it. Edith Nesbit features it in one of her children's stories, The Phoenix, and the Carpet, as does J.K. Rowling in the 'Harry Potter' series. According to the most popular variant of the phoenix, the bird lives in Arabia for 500 years at the end of which, it burns itself and its nest. In the version described by Clement, an ante-Nicene (basically, before Constantine legalized Christianity in the Roman Empire) Christian theologian, the phoenix' nest is made of frankincense, myrrh, and spices. A new bird always rises from the ashes. 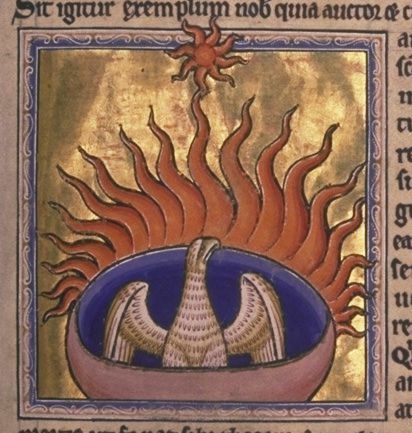 Ancient sources on the mythological phoenix bird, include Clement, the great mythographer and poet Ovid, the Roman natural historian Pliny (Book X.2.2), the top ancient Roman historian, Tacitus, and the father of Greek history, Herodotus.
" Ethiopia and India, more especially, produce1 birds of diversified plumage, and such as quite surpass all description. In the front rank of these is the phœnix, that famous bird of Arabia; though I am not quite sure that its existence is not all a fable. It is said that there is only one in existence in the whole world, and that that one has not been seen very often. We are told that this bird is of the size of an eagle, and has a brilliant golden plumage around the neck, while the rest of the body is of a purple colour; except the tail, which is azure, with long feathers intermingled of a roseate hue; the throat is adorned with a crest, and the head with a tuft of feathers. The first Roman who described this bird, and who has done so with the greatest exactness, was the senator Manilius, so famous for his learning; which he owed, too, to the instructions of no teacher. He tells us that no person has ever seen this bird eat, that in Arabia it is looked upon as sacred to the sun, that it lives five hundred and forty years, that when it becomes old it builds a nest of cassia and sprigs of incense, which it fills with perfumes, and then lays its body down upon them to die; that from its bones and marrow there springs at first a sort of small worm, which in time changes into a little bird: that the first thing that it does is to perform the obsequies of its predecessor, and to carry the nest entire to the city of the Sun near Panchaia, and there deposit it upon the altar of that divinity. The same Manilius states also, that the revolution of the great year 6 is completed with the life of this bird, and that then a new cycle comes round again with the same characteristics as the former one, in the seasons and the appearance of the stars; and he says that this begins about mid-day of the day on which the sun enters the sign of Aries. He also tells us that when he wrote to the above effect, in the consulship7 of P. Licinius and Cneius Cornelius, it was the two hundred and fifteenth year of the said revolution. Cornelius Valerianus says that the phœnix took its flight from Arabia into Egypt in the consulship8 of Q. Plautius and Sextus Papinius. This bird was brought to Rome in the censorship of the Emperor Claudius, being the year from the building of the City, 800, and it was exposed to public view in the Comitium.9 This fact is attested by the public Annals, but there is no one that doubts that it was a fictitious phœnix only." " There is another sacred bird, too, whose name is phoenix. I myself have never seen it, only pictures of it; for the bird seldom comes into Egypt: once in five hundred years, as the people of Heliopolis say." "  "Now these I named derive their origin from other living forms. There is one bird which reproduces and renews itself: the Assyrians gave this bird his name-the Phoenix. He does not live either on grain or herbs, but only on small drops of frankincense and juices of amomum. When this bird completes a full five centuries of life straightway with talons and with shining beak he builds a nest among palm branches, where they join to form the palm tree's waving top. As soon as he has strewn in this new nest the cassia bark and ears of sweet spikenard, and some bruised cinnamon with yellow myrrh, he lies down on it and refuses life among those dreamful odors.-And they say that from the body of the dying bird is reproduced a little Phoenix which is destined to live just as many years. When time has given to him sufficient strength and he is able to sustain the weight, he lifts the nest up from the lofty tree and dutifully carries from that place his cradle and the parent's sepulchre. As soon as he has reached through yielding air the city of Hyperion, he will lay the burden just before the sacred doors within the temple of Hyperion." " During the consulship of Paulus Fabius and Lucius Vitellius, the bird called the phoenix, after a long succession of ages, appeared in Egypt and furnished the most learned men of that country and of Greece with abundant matter for the discussion of the marvellous phenomenon. It is my wish to make known all on which they agree with several things, questionable enough indeed, but not too absurd to be noticed. That it is a creature sacred to the sun, differing from all other birds in its beak and in the tints of its plumage, is held unanimously by those who have described its nature. As to the number of years it lives, there are various accounts. The general tradition says five hundred years. Some maintain that it is seen at intervals of fourteen hundred and sixty-one years, and that the former birds flew into the city called Heliopolis successively in the reigns of Sesostris, Amasis, and Ptolemy, the third king of the Macedonian dynasty, with a multitude of companion birds marvelling at the novelty of the appearance. But all antiquity is of course obscure. From Ptolemy to Tiberius was a period of less than five hundred years. Consequently some have supposed that this was a spurious phoenix, not from the regions of Arabia, and with none of the instincts which ancient tradition has attributed to the bird. For when the number of years is completed and death is near, the phoenix, it is said, builds a nest in the land of its birth and infuses into it a germ of life from which an offspring arises, whose first care, when fledged, is to bury its father. This is not rashly done, but taking up a load of myrrh and having tried its strength by a long flight, as soon as it is equal to the burden and to the journey, it carries its father's body, bears it to the altar of the Sun, and leaves it to the flames. All this is full of doubt and legendary exaggeration. Still, there is no question that the bird is occasionally seen in Egypt." Examples: Harry Potter's magic wand has a feather from the same phoenix that gave a feather for the wand of Voldemort.